An opening ceremony for King Street’s protected bike lane in December. Photo: Being 808. 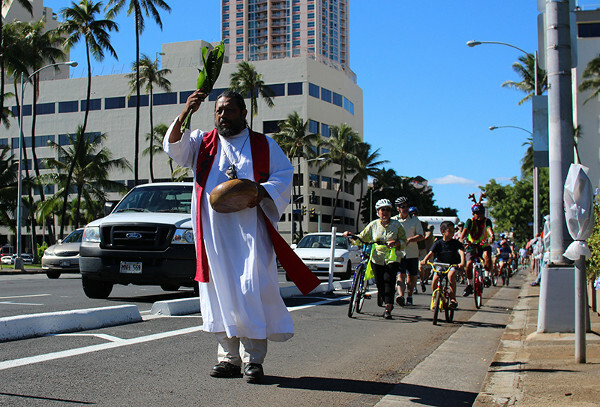 A few months after Honolulu’s first protected bike lane opened, it’s the latest to demonstrate a very consistent trend across the country: almost every protected bike lane cuts sidewalk biking in half. From August 2014 (before barriers were installed) to February 2015 (after), the number of bikes using King Street (both directions, road bed and sidewalk combined) soared 71 percent. And in the same period, Honolulu bicycle coordinator Chris Sayers said Monday, the number of bikes on the sidewalk plummeted 65 percent. That’s no big surprise, because someone biking on a sidewalk is just trying to ride in the protected bike lane that isn’t there. When cities make part of a street comfortable to bike in, people naturally choose to use it. That makes things better for everybody, Sayers said. “It just sort of organizes the whole roadway better,” he said. We’ve been in touch with bike coordinators around the country who’ve done similar counts, and compiled every such study we’re aware of into the chart below. 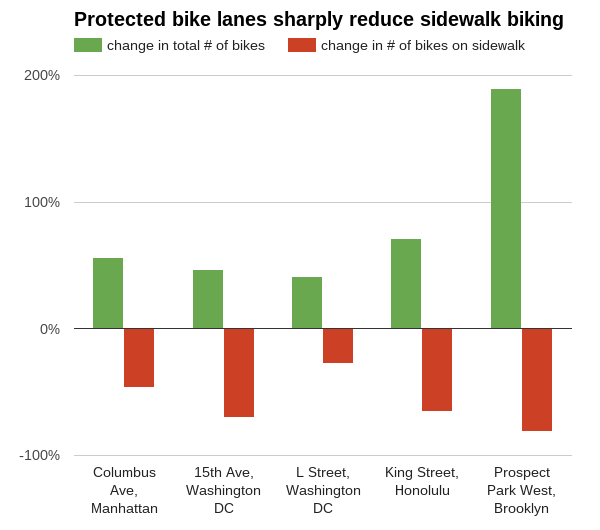 Honolulu’s finding is strikingly consistent with the others, all of which saw between a 27 percent drop in sidewalk biking (L Street in Washington DC) to an 81 percent drop (Prospect Park West in Brooklyn, New York). As you can see, those declines took place even though each protected bike lane dramatically boosted the total number of bikers. King Street is no exception; Sayers said riders have been so eager to use it that the city had to accelerate its plans to convert the 10-foot-wide lane with a three-foot buffer from a one-direction to a two-direction. 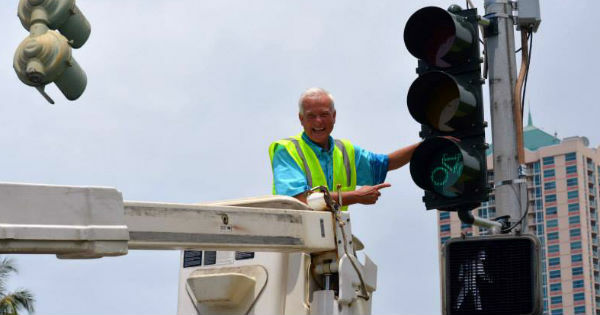 On Monday, Mayor Kirk Caldwell personally installed the first of 13 bike-specific signals on King Street. They’ll complete the lane’s conversion to two-way, with a buffer of curbs, posts and parked cars. Mayor Kirk Caldwell celebrates a milestone on Monday. Photo: City of Honolulu.